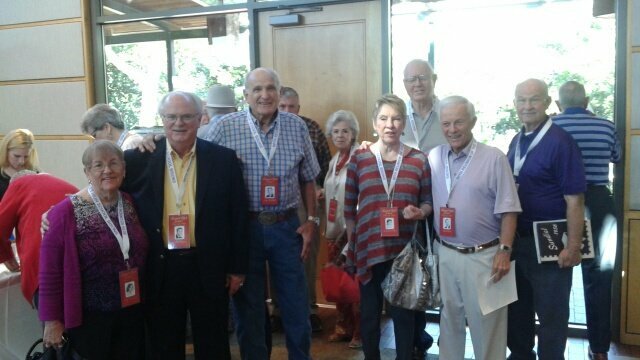 The Sunset High School class of 1956 held their 60th reunion Saturday, October 22. 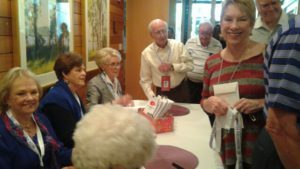 Approximately 150 people attended the reunion at the Dallas Arboretum near White Rock Lake. A smaller group of former lettermen enjoyed a golf tournament at Stevens Park the day before. Autumn at the Arboretum has been called one of “America’s Best Pumpkin Festivals,” and pumpkins of all sizes and shapes were on display throu ghout the grounds. 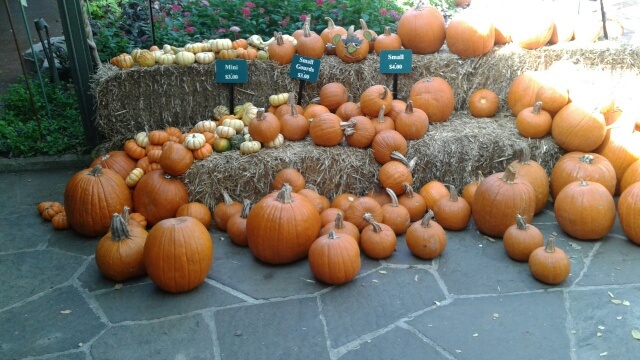 More than 75,000 pumpkins, gourds and squash were featured, along with 150,000 beautiful fall flowers and trees at the Arboretum. At spacious Rosine Hall, headquarters for the reunion events, Bisons roamed among the pumpkins. 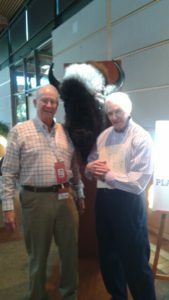 Sunset alumni and their guests lined up for photos with a lively costumed Bison, a more sedate Bison head, or simply with each other. To help identify former classmates, name tags featured photos from the 1956 high school yearbook. Gil’s Elegant Catering spread a sandwich buffet for lunch, followed by more photos and more mingling. Some students formed groups with others who had attended the same elementary schools to take photos from their earliest school days. Reunion organizers and sponsors included Diane Pollard, Ron Harris, Jim Daffron, David Young, Dennis Chandler, Bill Ed Roberts, and Sandra and Bob Bozman. The entertainment was “Good Old Fifties Music” by legendary Dallas favorites the Levee Singers. The still-popular group is led by Ed Bernet with Ralph Sanford on guitar, Ralph Lindsey on bass, and Dave Tanner, piano and vocals. The reunion came to a close following an Italian buffet that ended on a sweet note, with Crème Brulee for dessert. Not content to wait five years for their next reunion, Sunset alumni hold regular lunch meetings at the downtown Dallas El Fenix. Sunset High School’s principal in 1956 was Mr. C. C. Miller. One of the most famous athletes from the class of 1956 was future Olympic silver medalist Eddie Southern, who started his track career by winning four state championships while at Sunset. Sunset High School first opened its doors in 1925, welcoming 1,400 students and 39 teachers to the southwest Oak Cliff campus on Jefferson Blvd. It was the second high school for Oak Cliff, with Oak Cliff High (now W. H. Adamson) the first. The American Bison is Sunset’s mascot, chosen because early students had to cross open fields to walk to school. On September 26, 2015, Sunset celebrated the 90th Anniversary of the school, officially dedicating its Texas Historical Landmark Marker. The Dallas Historical Landmark Marker and the Byron Rhome Football Fieldhouse (named for longtime, championship football coach) was also dedicated. The ceremony was attended by over 700 people, including Coach Rhome’s son, Jerry Rhome. A former Sunset High School ball player, Rhome later played professional football.